The occipital bone is located in the posterior part of the skull. It’s identified by the presence of the large foramen magnum. It’s an enlarged plate above and behind the foramen magnum. It presents 2 surfaces and 3 angles. A median elevation in the point of its maximum convexity called External occipital protuberance. The most notable point of the protuberance is referred to as inion. A bony crest running down-wards from external occipital protuberance to the foramen magnum called External occipital crest. 2 superior nuchal lines, 1 on every side, arch laterally from external occipital protuberance. 2 inferior nuchal lines, 1 on every side curve laterally from the middle of the external occipital crest. Internal occipital protuberance, a bony elevation near the center. Internal occipital crest, a vertical bony crest which runs downwards from the internal occipital protuberance in the direction of the foramen magnum. Near the foramen magnum it divides to create a triangular depression referred to as vermian fossa. Sagittal sulcus/groove, runs upwards in the direction of the superior angle it’s inhabited by superior sagittal sinus. Transverse sulcus/groove, 1 on every radiate in the direction of the lateral angle; it’s inhabited by the transverse sinus. A groove descends downwards in the direction of the foramen magnum. It’s inhabited by the occipital sinus. The small parts of grooves for sigmoid and inferior petrosal sinuses are also viewed on the internal surface. 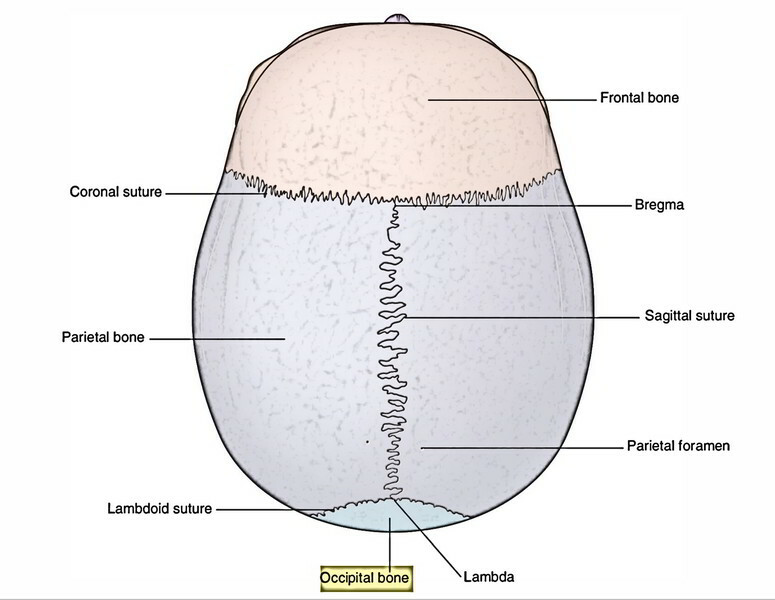 The squamous part of temporal bone below the highest nuchal line is ossified in cartilage from 2 centers- 1 on every side in the 7th prenatal week and shortly joins with every other. The squamous part above the highest nuchal line is ossified in membrane from 2 centers- 1 on every side in the 8th prenatal week and shortly fuses with every other. The 2 portions, upper and lower, of squamous part generally connect with every other in the third month after beginning when the baby begins holding his neck. Occasionally the part above the highest nuchal line stays different and continues as interparietal bone. It’s situated 1 on every side of the foramen magnum. The medial part bears occipital condyles. The lateral part, a quadrilateral plate projecting laterally from the posterior half of the occipital condyle is termed jugular process. The outer opening of hypoglossal canal carrying hypoglossal nerve is located lateral to the anterior part of the occipital condyle. The depression just behind the occipital condyle is referred to as condylar fossa. Occasionally it presents a foramen in its floor referred to as posterior condylar canal. The anterior margin of jugular process presents a concave jugular notch which with quite similar notch on the petrous temporal bone creates the jugular foramen. The superior surface of the condylar part presents the jugular tubercle. It’s a wide bar of bone which is located in front of the foramen magnum and articulates in front together with the body of sphenoid to create the basisphenoid joint (a primary cartilaginous joint). The upper surface of the basisphenoid presents a shallow gutter, which slopes downwards and backwards from dorsum sellae to the foramen magnum. It’s referred to as clivus. The inferior surface of the basilar part presents a pharyngeal tubercle in median plane, about 1 cm in front of the foramen magnum. The basisphenoid joint accounts for development of the skull in length. Medigolegal significance of basisphenoid joint: The basisphenoid joint is of medicolegal significance in evaluating the exact age of the individual. It’s the primary cartilaginous joint with plate of hyaline cartilage between the basilar part of the occipital bone and posterior part of the body of sphenoid bone. This cartilaginous plate is entirely replaced by the bone (synostosis) by the 25th year of the age.